"trichromat" redirects here. For the chemical ion species, see trichromate. Trichromacy or trichromatism is the possessing of three independent channels for conveying color information, derived from the three different types of cone cells in the eye. Organisms with trichromacy are called trichromats. The normal explanation of trichromacy is that the organism's retina contains three types of color receptors (called cone cells in vertebrates) with different absorption spectra. In actuality the number of such receptor types may be greater than three, since different types may be active at different light intensities. In vertebrates with three types of cone cells, at low light intensities the rod cells may contribute to color vision. Humans and some other mammals have evolved trichromacy based partly on pigments inherited from early vertebrates. In fish and birds, for example, four pigments are used for vision. These extra cone receptor visual pigments detect energy of other wavelengths, including sometimes ultraviolet. Eventually two of these pigments were lost (in placental mammals) and another was gained, resulting in trichromacy among some primates. Humans and closely related primates are usually trichromats, as are some of the females of most species of New World monkeys, and both male and female howler monkeys. Recent research suggests that trichromacy may also be quite general among marsupials. A study conducted regarding trichromacy in Australian marsupials suggests the medium wavelength sensitivity, MWS, cones of the honey possum (Tarsipes rostratus) and the fat-tailed dunnart (Sminthopsis crassicaudata) are features coming from the inherited reptilian retinal arrangement. The possibility of trichromacy in marsupials potentially has another evolutionary basis than that of primates. Further biological and behavioural tests may verify if trichromacy is a common characteristic of marsupials. Most other mammals are currently thought to be dichromats, with only two types of cone (though limited trichromacy is possible at low light levels where the rods and cones are both active). Most studies of carnivores, as of other mammals, reveal dichromacy, examples including the domestic dog, the ferret, and the spotted hyena. Some species of insects (such as honeybees) are also trichromats, being sensitive to ultraviolet, blue and green instead of blue, green and red. Research indicates that trichromacy allows animals to distinguish red fruit and young leaves from other vegetation that is not beneficial to their survival. Another theory is that detecting skin flushing and thereby mood may have influenced the development of primate trichromate vision. The color red also has other effects on primate and human behavior as discussed in the color psychology article. Primates are the only known placental mammalian trichromats. [not in citation given] Their eyes include three different kinds of cones, each containing a different photopigment (opsin). 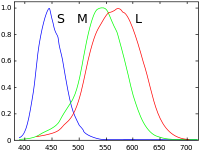 Their peak sensitivities lie in the blue (short-wavelength S cones), green (medium-wavelength M cones) and yellow-green (long-wavelength L cones) regions of the color spectrum. (Schnapf et al, 1987). S cones make up 5–10% of the cones and form a regular mosaic. Special bipolar and ganglion cells pass those signals from S cones and there is evidence that they have a separate signal pathway through the thalamus to the visual cortex as well. On the other hand, the L and M cones are hard to distinguish by their shapes or other anatomical means – their opsins differ in only 15 out of 363 amino acids, so nobody has yet succeeded in producing specific antibodies to them. But Mollon and Bowmaker did find that L cones and M cones are randomly distributed and are in equal numbers. Trichromatic color vision is the ability of humans and some other animals to see different colors, mediated by interactions among three types of color-sensing cone cells. The trichromatic color theory began in the 18th century, when Thomas Young proposed that color vision was a result of three different photoreceptor cells. Hermann von Helmholtz later expanded on Young's ideas using color-matching experiments which showed that people with normal vision needed three wavelengths to create the normal range of colors. Physiological evidence for trichromatic theory was later given by Gunnar Svaetichin (1956). Since the likelihood of response of a given cone varies not only with the wavelength of the light that hits it but also with its intensity, the brain would not be able to discriminate different colors if it had input from only one type of cone. Thus, interaction between at least two types of cone is necessary to produce the ability to perceive color. With at least two types of cones, the brain can compare the signals from each type and determine both the intensity and color of the light. For example, moderate stimulation of a medium-wavelength cone cell could mean that it is being stimulated by very bright red (long-wavelength) light, or by not very intense yellowish-green light. But very bright red light would produce a stronger response from L cones than from M cones, while not very intense yellowish light would produce a stronger response from M cones than from other cones. Thus trichromatic color vision is accomplished by using combinations of cell responses. It is estimated that the average human can distinguish up to seven million different colors. ^ a b Arrese, Catherine; Thomas, Nathan; Beazley, Lyn; Shand, Julia (2002). "Trichromacy in Australian Marsupials" (PDF). Current Biology. 12 (8): 657–660. doi:10.1016/S0960-9822(02)00772-8. PMID 11967153. Retrieved 1 April 2012. ^ a b Rowe, Michael H (2002). "Trichromatic color vision in primates". News in Physiological Sciences. 17 (3): 93–98. ^ Arrese, CA; Oddy, AY; Runham, PB; Hart, NS; Shand, J; Hunt, DM (2005). "Cone topography and spectral sensitivity in two potentially trichromatic marsupials, the quokka (Setonix brachyurus) and quenda (Isoodon obesulus)". Proceedings of the Royal Society of London B. 272 (1595): 791–796. doi:10.1098/rspb.2004.3009. PMC 1599861. ^ Calderone, JB; Jacobs, GH (2003). "Spectral properties and retinal distribution of ferret cones". Visual Neuroscience. 20 (1): 11–17. doi:10.1017/s0952523803201024. ^ Calderone, JB; Reese, BE; Jacobs, GH (2003). "Topography of photoreceptors and retinal ganglion cells in the spotted hyena (Crocuta crocuta)". Brain, Behavior and Evolution. 62 (4): 182–192. doi:10.1159/000073270. ^ Sharpe LT, de Luca E, Hansen T, Jägle H, Gegenfurtner KR (2006). "Advantages and disadvantages of human dichromacy". Journal of Vision. 6 (3): 213–223. doi:10.1167/6.3.3. ^ Diana Widermann, Robert A. Barton, and Russel A. Hill. Evolutionary perspectives on sport and competition. In Roberts, S. C. (2011). Roberts, S. Craig (ed.). "Applied Evolutionary Psychology". Oxford University Press. doi:10.1093/acprof:oso/9780199586073.001.0001. ISBN 9780199586073. ^ Ronald G. Boothe (2002). Perception of the visual environment. Springer. p. 219. ISBN 978-0-387-98790-3. ^ Wässle, Heinz (11 February 1999). "Colour vision: A patchwork of cones". Nature. 397 (6719): 473–475. doi:10.1038/17216. PMID 10028963. Retrieved 2011-11-26. ^ Svaetichin, G (1956). "Spectral response curves from single cones". Acta Physiologica Scandinavica. 39 (134): 17–46. PMID 13444020. ^ Kandel ER, Schwartz JH, Jessell TM (2000). Principles of Neural Science (4th ed.). New York: McGraw-Hill. pp. 182–185. ISBN 0-8385-7701-6. ^ Jacobs GH, Nathans J (March 2009). 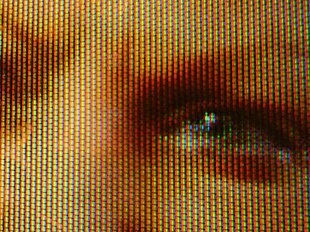 "Color Vision: How Our Eyes Reflect Primate Evolution". Scientific American. ^ Leong, Jennifer. "Number of Colors Distinguishable by the Human Eye". hypertextbook. Retrieved 21 February 2013. Svaetichin, Gunnar; MacNichol, Edward F. (November 1958). "Retinal mechanisms for chromatic and achromatic vision". Annals of the New York Academy of Sciences. 74 (2): 385–404. doi:10.1111/j.1749-6632.1958.tb39560.x. PMID 13627867.